Jackie Pahoa wants to leave her mark on a sport she adores. When it comes to football, finding motivation is easy for New Caledonia’s Jackie Pahoa. It’s a sport she loves more than any other, a sport where she’s keen to leave her mark. And if the 15-year-old’s performances for New Caledonia at the OFC U-16 Women’s Championship are anything to go by she’s well on her way. 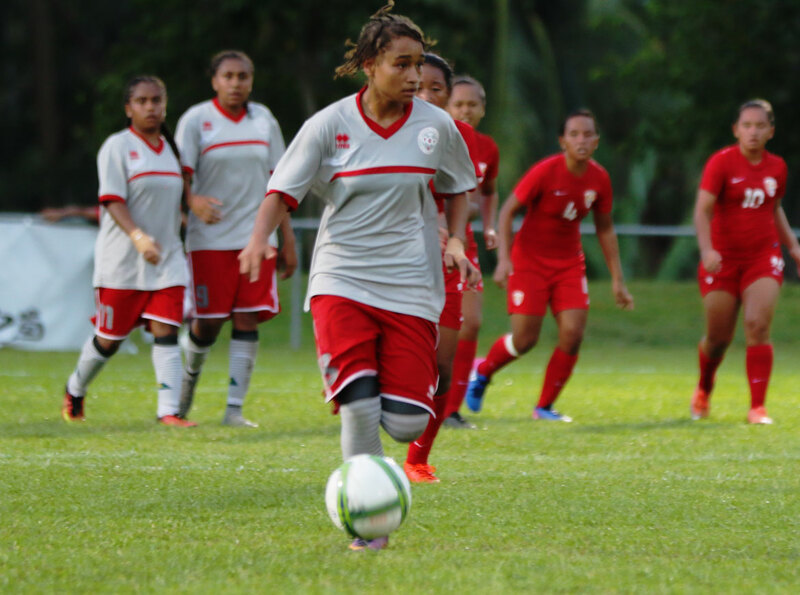 Pahoa made her international debut for New Caledonia at the OFC U-17 Women’s Championship in Rarotonga in 2016, playing a key role in all five of their matches and scoring four goals. She’s scored twice so far in Samoa but her contribution is about more than putting the ball in the back of the net. “In a group, it’s always good to have some players who have already taken part in a competition,” New Caledonia U-16 women’s coach Matthieu Delcroix said. Creating a close-knit team environment is important to this New Caledonia squad and Pahoa knows that forms a strong foundation for success. “We have a great team and since we arrived we’ve been winning because we get along well. The environment we’ve created for ourselves is good,” she explains. Being so close, Pahoa said, means each of the players are striving for the same goals. “We want to win,” she stated. “We’ve left our country behind, we’ve left our families, our friends, everyone close to us, to come and represent our country well. It’s not hard to see the passion Pahoa has for football. Off the field she’s reserved and quiet. On it, she’s determined and fierce. She’s also unafraid of admitting that she’s still a player in development. “The most difficult thing for me is having to defend,” she admitted. Pahoa and her side are set to play Fiji in the semi-finals, the same team they fell to in the Play-off for third in 2016. “I try to push the girls to improve, to aim higher and try and secure a place in the final,” she said. Part of that progression includes developing tenacity and with it the ability to bounce back. Which is why Pahoa shone against Tahiti in her side’s final group match on Saturday. “The first half we dropped our heads because they scored a goal. But the coach was good, he spoke to us, encouraged us to keep playing and we came back in the second half. Pahoa scored the equaliser in the opening minute of the second half and continued to apply pressure to their Tahitian opponent. Coming deep to defend despite her dislike for it, weaving her way through the midfield with deft touches and perfectly weighted passes all of which helped her side lift their game and eventually secure the winner which saw them through to the semi-finals. A place in the final is next on her to-do-list, and she doesn’t want to stop there. “I want to keep playing football but I want to do more,” she said.